GEOFF GUNDERSON began learning guitar on his own when he was just 10 years old. At 14, he was playing professionally. Geoff was a founding member of the popular 80’s rock group, Wakefield for which he was recently inducted into the South Dakota Rock and Roll Hall of Fame. While touring with Wakefield throughout the 80’s, Geoff was studying classical guitar and teaching others. He went on to study under Christopher Johnson at USD. 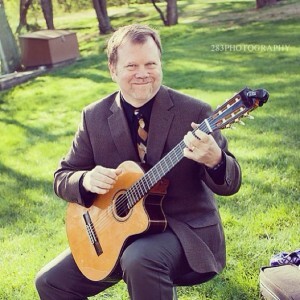 Geoff currently teaches classical and contemporary guitar at Augustana University in Sioux Falls, SD and Dordt College in Sioux Center, IA and is the director of the Chilbloom Guitar Program of Sioux Falls. Geoff also frequently performs as a solo guitarist at Sioux Falls area venues. Geoff has performed with the JukeBox Zeroes, the South Dakota Symphony, the Sioux City Symphony, the Sioux City Rockestra, and countless other projects. A lifelong resident of Sioux Falls, Mr. Gunderson lives with his wife Erin and has two grown daughters.